The history of Rocky, Missy and Silver, three bottlenose dolphins, and the dedicated men and women who made a dream come true. Animal rights activists, marine biologists, scientists, veterinarians trainers, Turks and Caicos islanders and filmmakers all joined together in the historic rehabilitation and release of these abused and captive dolphins. After months of intensive training, Rocky, Missy and Silver were released to explore the oceans and choose their own destiny. Imagine being set free after 20 years of confinement. 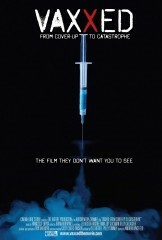 Follow the true and heartwarming story in this one-hour video presentation. 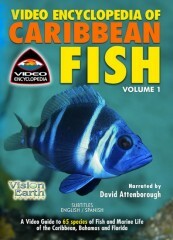 An informative guide to life beneath the waters of the Caribbean, Florida, and the Bahamas. View over 65 species of fish and marine animals in their natural habitat, beautifully filmed with state-of-the-art equipment. 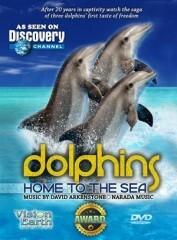 Narrated by renowned naturalist David Attenborough with music by David Arkenstone, Narada Music. Join us on a delightful journey to the bottom of the Caribbean Sea! 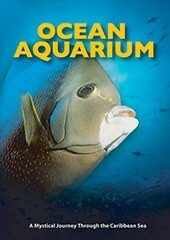 Dive down into the colourful, out of this world environments filled with fantastic fishes of all shapes and sizes. Get lost in the majestic coral reefs, swim alongside a school of Blue Tangs, and always keep an eye out for the curious and nimble Barracuda. Explore the colorful and fascinating marine life of the Caribbean. This beautifully photographed video will take you over miles of some of the most spectacular coral reefs. You'll fall in love with playful angelfish, or get lost in expansive coral gardens. 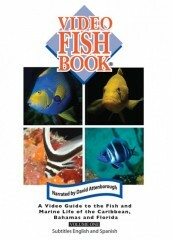 This sixty minute video covers 75 species of fish in their natural reef environment. 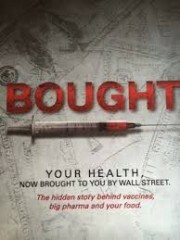 ​With prescription medications now in the Top 10 killers of Americans, taking more lives than illegal drugs and more lives than car accidents, this timely documentary shows that there is a safer, more effective and cheaper way to tackle illness. 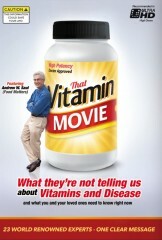 It reveals a 65 year history demonstrating that vitamins and other supplements work. Experts from all around the world give plain and simple advice which they believe will help us live longer, feel better and cut worldwide healthcare budgets by billions. 100 lbs overweight, loaded up on steroids and suffering from a debilitating autoimmune disease, Joe Cross was at the end of his rope. Tipping the scales at 310 lbs, Joe saw a path laid out before him that wouldn't end well. 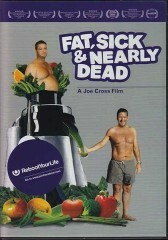 FAT SICK & NEARLY DEAD is an inspiring film that chronicles Joe's personal mission to regain his health. 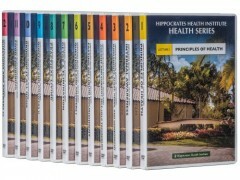 Annette Larkins, author of the booklets Journey To Health and Journey To Health 2, introduces royal treats of life in The Kingdom of Living Foods. 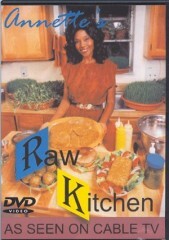 From her 12-part television series Health Alternatives with Living Foods, she delights and entertains while demonstrating how simple it is to prepare "flavorlicious", raw food dishes. These mouth-watering goodies dispel the myth that raw meals consist simply of lettuce and tomatoes. Watch, learn, and use acquired knowledge to make easy, tasty recipes, designed to encourage a healthier lifestyle. The Breakfast and More, Pizza and More, Lunch and More, and Dinner and More presentations will inspire you, your family and friends to create your own raw cuisine, which will have you chanting "Yummy, yummy for my tummy." 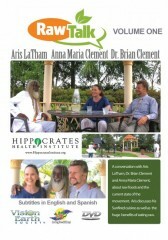 A conversation with Aris LaTham, Brian Clement, and Anna Maria Clement, about raw foods and the current state of the movement. 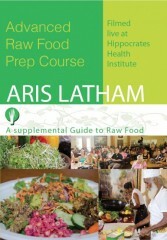 Aris discusses his Sunfired cuisine as well as the huge benefits of eating raw. 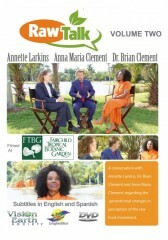 Living), these giants of living food sit down to discuss their individual ideals, and delve into some of the most pressing matters of the current raw vegan food movement. 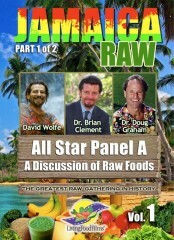 The intent of this panel is to share Brian Clement, Doug Graham, and David Wolfe's expertise and opinions on topics such as: a sustainable living, a vegan raw food diet, the nutritional benefits of living foods, and general approaches to health and hygiene. Listening to where their ideals enthusiastically coincide, and where their opinions differ (sometimes quite strongly), offer fascinating insight into the practical details of living raw and staying fit. Further, in this video, they dive in and explore these differences of perspective in depth, and through Brian, Doug, and David's understanding of these critical topics, we can come to our own personal conclusions and through this grow in our own way! 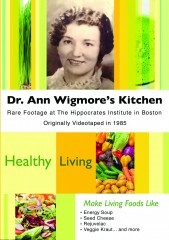 In this video Dr. Ann shows how to make living foods like: energy soup, seed cheese, rejuvelac, veggie kraut, and more. Visit her pantry where she shows how to grow wheat grass. Learn to sprout, compost, plant, and harvest. An addendum by Dr. Flora adds insight from working with Dr. Ann for 25 years and explains Dr. Ann's dedication to wild edible weeds. 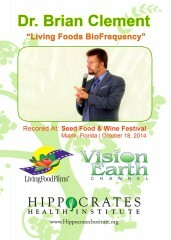 Dr. Brian Clement "Living Foods Bio-Frequency"
Dr. Brian Clement (Co-Director of Hippocrates Health Institute) speaks at the Seed Food & Wine Festival about living food bio-frequencies.